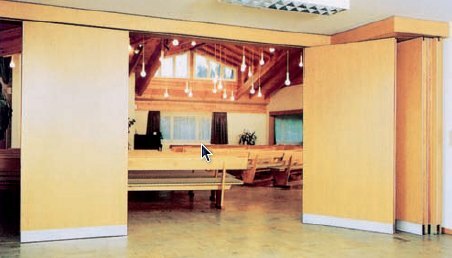 Movable walls or partitions that consist of hanging sliding panels and doors. A space set aside to store the panels in moveable panel partitions systems. 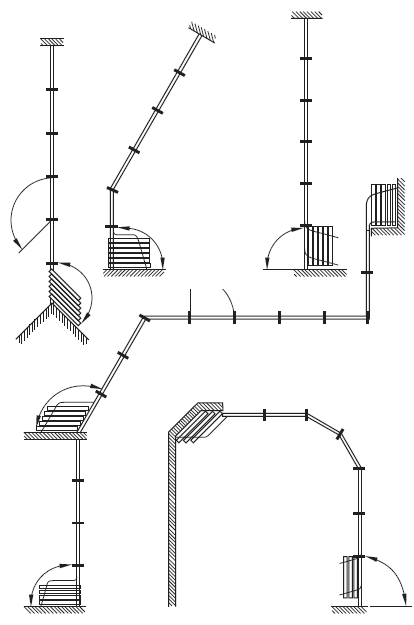 Here is a sketch showing some possible layouts of this system. As you can see the combinations are almost endless. The brilliance of these systems is the fact that the panels are not fixed on a single track in a straight line. 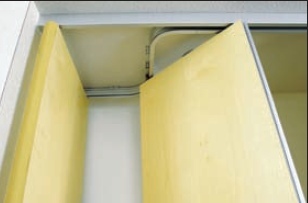 They do not run each separate panel in it's own track, like traditional Japanese Shoji doors, because that would show a stepped effect at the panel joints. Neither do they use the multi-fold door system where the panels are joined together, because then longer walls would be too hard to handle. These systems use a double overhead track that splits into two sections at the parking area. This allows each panel to be moved separately making the deployment or stowing away of these walls easy for one person. Alternatively these operable wall systems can be fully automated. As you can see in the layouts above, door positions in the walls are simply a matter of placing a swinging door panel in the desired place. Now we are getting into the details of what makes this system work. Looking up in this photo of a panel just about to change direction. It is easy to see that the track diverges into two sections with one of the door hangers staying on the rear track and the other hanger staying on the front track. 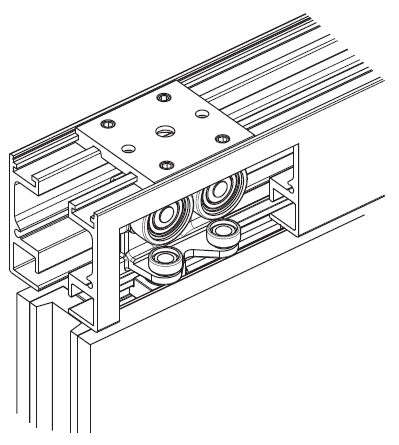 Here we see a cutaway sketch showing the layout of the roller hanger and track. Each door hanger slides on different parts of what is in effect a combined track. The beauty of the systems that there are two sets of rollers to each hanger fitting. One carries the weight vertically and the other works sideways to keep everything on track when changing direction. Worth noting also is the panel edge detail showing that the joints in the panels are made like a tongue and groove, so that as is normal the panel joints can be made dust, light os sound proof. More details of a similar installation is on the partition doors page.